Dr. Lynn Hagood isn’t letting the fact that he earned his DVM from Auburn University’s College of Veterinary Medicine in 1988 stop him from continuing to learn and grow as a veterinarian. Dr. Hagood (right) observes a minor surgical procedure with the Oncology Service. A general practitioner at North Florida Animal Hospital, in Tallahassee, Fla., Dr. Hagood has a particular interest in oncology. 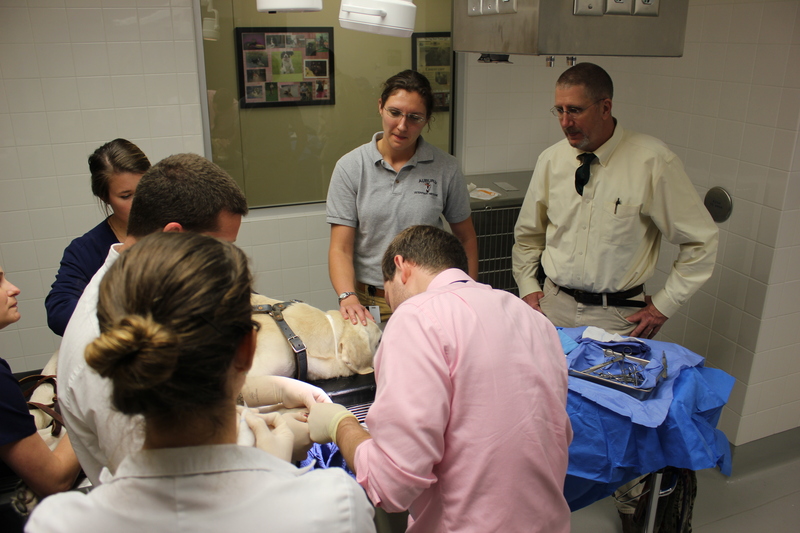 In order to learn more, and keep up with the constantly evolving field of veterinary medicine, Dr. Hagood took advantage of the Practitioner Sabbatical Program offered through the college’s Office of Continuing Education. The sabbatical program allows a licensed veterinarian to ‘shadow’ a faculty clinician at either the Bailey Small Animal Teaching Hospital or the JT Vaughan Large Animal Teaching Hospital, observing cases and interacting with staff and students. Applicants to the program select the specialty field they want to study during their time at the college, and pick their schedule. The program allows up to five days of hands-on experience in their chosen field, while also earning continuing education credits. The program is open to any licensed veterinarian, and costs range from $125–$200 per day, depending on the chosen field of study. Applications are due at least 45 days in advance of the proposed starting date, along with a $25 registration fee. The benefits of the sabbatical program are mutual to both parties. Dr. Stephanie Schleis, an associate clinical professor of oncology, is Dr. Hagood’s sponsor for his sabbatical, and said that having the veterinarians complete the program offers value to all participants. Dr. Hagood has already completed several sabbatical sessions at the college, including a rotation in veterinary cardiology. To learn more about the Practitioner Sabbatical Program at Auburn, click here. To register for a sabbatical, contact the continuing education coordinator, Kris Street, at roberkr@auburn.edu.